A person or organization that makes a loan. That is, a lender gives money to a borrower with the expectation of repayment in a timely manner, almost always with interest. Fig. 50 Ledger. 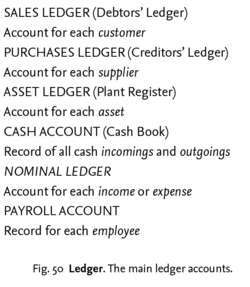 The main ledger accounts. a person, company or institution that provides a BORROWER with MONEY or some other asset (for example machinery, property) in the form of a LOAN, MORTGAGE or LEASING arrangement in order to finance consumption and investment. See DEBT, FINANCIAL SYSTEM, COLLATERAL SECURITY. a person, firm or institution that makes a LOAN to a BORROWER to enable the borrower to finance CONSUMPTION or INVESTMENT. Lenders frequently require borrowers to offer some COLLATERAL SECURITY, for example, property deeds, which lenders may retain in the event of borrowers failing to repay the loan. See alsoCREDIT, FINANCIAL SYSTEM. One who advances money to another in the expectation of receiving repayment of the money plus a fee for the use of the money, called interest. Unfortunately, lenders rarely update their appraisals during the construction process and loan documents really do not provide a mechanism to cure a mid-construction dip in value. Technically, a second-lien loan is a secured bank loan where the second-lien lenders share in the same collateral as the first-lien lenders. In a community where one would expect to find five payday lenders, there are 24 such outlets within three miles of the base. In fact, A/R financing from an established lender that understands the unique challenges of operating nursing homes often is the only way to overcome the "reimbursement blues" caused by slow, inconsistent payers. This offers an important opportunity at a time when lenders across the country recognize the value of improving and sustaining strong business relationships. Traditionally, lenders could look to the industry to be very stable. As an added convenience to lenders, LIS has added on-line registration forms allowing for a variety of payment (Visa/MC) and length of membership (1-12 months) options. The lender may, however, be able to claim the benefits of a treaty between its country and the United States, since the recharacterized payments will be regarded as being made directly from the United States to the lender. com to empower consumers by providing them with the information and tools they need to make a smart borrowing decision and they never have to enter their personal information to see the latest offers from ethical lenders. Still, lenders are in the business of lending money and they do want the opportunity to finance projects. Count on lenders to be exacting and detail-oriented (and sometimes humorless), which can make the financing process excruciating if you have not negotiated a lender-friendly lease.